Not recommended for new designs. This product is approaching EOL. Please contact Embedded Works about the KH3 Series, which replaces the KH2. The KH2 Series is ideally suited for OEM applications, such as remote control / command, security, and automation. The KH2 transmitter combines a highly optimized SAW-based RF transmitter with an on-board encoder. 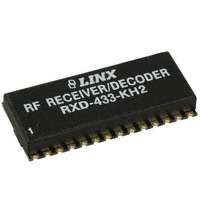 The KH2 Series receiver combines a high-performance receiver with an on-board decoder. The transmitter module accepts up to eight parallel inputs, allowing direct connection of switches, contacts, or microprocessor control lines. The receiver module provides eight logic-level outputs for connection of devices under control, such as relays, motors, indicators, or microprocessor lines. Ten tri-state address lines are also provided to allow for security and the creation of 310 (59,049) unique transmitter / receiver relationships. Together, the modules form a reliable wireless connection capable of operation over distances of up to 3,000 feet. The modules are also individually compatible with a complete family of FCC pre-certified OEM products, which include keyfob and handheld transmitters, relay and AC control modules. Housed in compact reflow-compatible SMD packages, the modules require no tuning or external RF components (except an antenna).